Mark Holden serves as senior vice president, general counsel and corporate secretary of Koch Industries, Inc. He is also president and COO of the Legal Division of Koch Companies Public Sector, LLC, which provides legal, government and public affairs services to Koch Industries, Inc. and its affiliates. In addition, he also serves as Chairman of the Board of Freedom Partners Chamber of Commerce, Inc. and serves on the Board of Directors of Americans For Prosperity. Mr. Holden also serves on the boards of two Koch Industries subsidiaries: Georgia-Pacific Equity Holdings, LLC, and Molex Electronic Technologies Holdings, LLC. 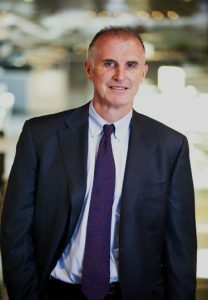 He is a member of Georgia-Pacific’s Legal and Public Affairs Committee and Koch Industries’ Compliance and Ethics Committee. Mr. Holden began his career with Koch Industries in 1995 as a litigation attorney, and was vice president and general counsel for litigation and compliance. He has worked with the various Koch companies on a variety of litigation, regulatory, compliance, and commercial issues. Before joining Koch, Mr. Holden was an associate with Akin, Gump, Strauss, Hauer & Feld in Washington, D.C.
Mr. Holden earned a bachelor’s degree in political science from the University of Massachusetts. He earned his law degree from the Columbus School of Law at the Catholic University of America, where he was an associate editor of the Catholic University Law Review. Based in Wichita, Kan., Koch Industries, Inc. is one of the largest private companies in America with estimated annual revenues as high as $115 billion, according to Forbes. It owns a diverse group of companies involved in refining, chemicals, grain processing and biofuels; forest and consumer products; fertilizers; polymers and fibers; process and pollution control equipment and technologies; electronic components; commodity trading; minerals; energy; ranching; glass; and investments. Since 2003, Koch companies have invested more than $70 billion in acquisitions and other capital expenditures. With a presence in about 60 countries, Koch companies employ more than 100,000 people worldwide, with about 60,000 of those in the United States. From January 2009 to present, Koch companies have earned more than 930 awards for safety, environmental excellence, community stewardship, innovation, and customer service.